Recruiters who want to attract the best candidates understand that they bear as much responsibility for outcomes as the candidates they interview do. 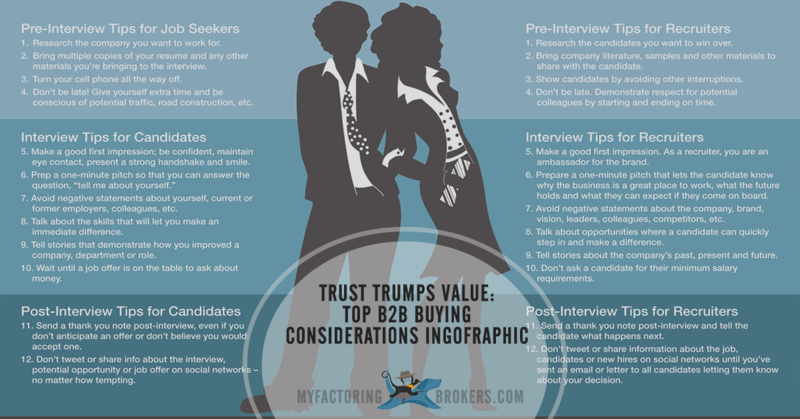 Here is an infographic list of twenty-four tips to improve hiring outcomes for interviewers as well as interviewees. We tend to view the balance of power in an interview process as being weighted toward the employer or recruiter, but that’s not necessarily the case, especially for recruiters who want to attract the best candidates for placement with clients or within their own organization. 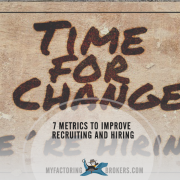 Just as the candidate is responsible to persuade the hiring manager that they are the right person for the job, it’s incumbent on the recruiter to persuade top candidates that a job, and company, is right for them. 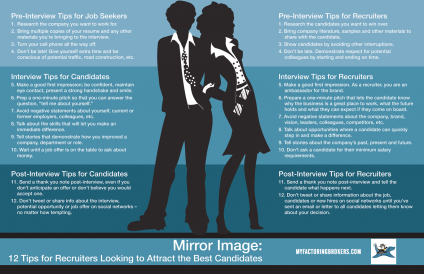 When we came across a Doherty infographic listing a dozen tips for candidates to complete before, during and after an interview, it occurred to us that a mirror image could be created for recruiters who want to attract the best candidates. For instance, if it behooves the candidate to familiarize themselves with the company by doing research about the company’s brand, history, vision, etc., wouldn’t it be a good thing for the recruiter to do the same? Today’s social media and online search capabilities make it super-easy for an employer or recruiter to research the work history and even the goals and dreams of candidates. They can use this information to show top applicants why a company or job would be a good fit for them and how it can help them achieve their personal as well as professional aspirations. This will help you prepare for questions they may ask and the talking points you bring up will demonstrate your interest in the role. 1. Research the candidates you want to win over. 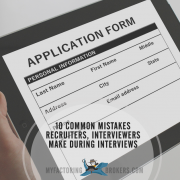 A better understanding of their professional work history and aspirations will make it easier for you to draw them out during the interview and (if appropriate) put together a more competitive job offer. 2. 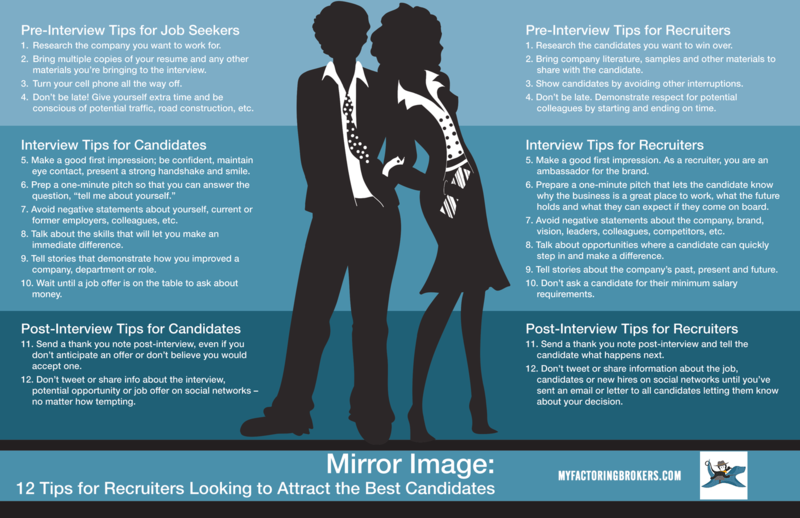 Bring multiple copies of your resume and any other materials you’re bringing to the interview. 2. Bring company literature, samples and other materials to share with the candidate. 3. Turn your cell phone off; putting it on vibrate isn’t good enough. 3. Show candidates that they are important to you by ignoring your own cell or desk phone and avoiding other interruptions. 4. Don’t be late! Give yourself extra time so that you arrive early and be conscious of potential traffic, travel route construction, etc. 4. Don’t be late. The candidate’s time is important and you demonstrate respect for potential colleagues when you start and end the interview on time. 5. Make a good first impression; be confident, maintain eye contact, present a strong handshake and smile. 5. Make a good first impression. As a recruiter, you are an ambassador for the brand and your demeanor, attitude and presentation tell the candidate what it’s going to be like to work there if they take the job. 6. 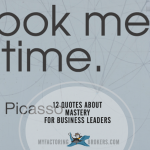 Prep a one-minute pitch so that you can answer the question, “tell me about yourself,” concisely, clearly and in a way that shows your aptitude and ability to get the job done. 6. Prepare a one-minute pitch that lets the candidate know why the business is a great place to work, what the future holds and what they can expect if they come on board. 7. 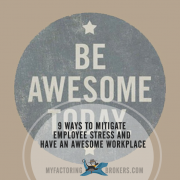 Avoid negative statements about yourself, current or former employers, colleagues, etc. The tone you set, words you use and stories you tell say a lot about you and may not be kept private. 7. Avoid negative statements about the company, brand, vision, leaders, departmental colleagues, competitors, etc. The tone you set, words you use and stories you tell say a lot about you and the company, and may not be kept private. 8. Talk about the skills, abilities or experience that will let you make an immediate difference. 8. Talk about opportunities where a candidate can quickly step in and make a difference; no candidate wants to take a job and not be allowed to work! 9. Tell stories that demonstrate how you improved a company, department or role by developing, enhancing, or applying specific skills in your current and past professional roles. 9. Tell stories about where the company, department or role is, how it has changed, and how it will change in the future. Remember that the candidate wants to know just as much about the company as you want to know about them, so that you can both make a good decision. 10. Wait until a job offer is on the table to ask about money. Be prepared (if an offer is extended) to negotiate and use market data, especially if the compensation package desired is significantly different from the one offered. Remember that salary is rarely the factor that makes a job great – or miserable – day in and day out. 10. Don’t ask a candidate for their minimum salary requirements; it’s the equivalent of asking “how little will you take” and puts the candidate in the awkward position of worrying that they might be asking for too much or too little – either of which could cost them a job offer. Do tell them what happens next and how long they might have to wait to find out whether they will be moving forward in the process. 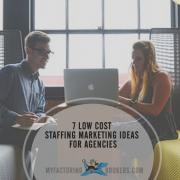 If you are going to extend an offer, use market research, budgetary constraints and the idea that “you get what you pay for” help you craft a competitive compensation package and allow for wiggle room during negotiations. 11. Send a thank you note post-interview, even if you don’t anticipate an offer or don’t believe you would accept one – you never know how making a good impression with recruiters could help you now or in the future. 11. Send a thank you note post-interview and let them know what to expect next (or whether they will be moving forward). A post-interview thank you note is another opportunity to present the brand positively, demonstrate a culture of communication and show the candidate that they are important to you. 12. Don’t tweet or share info about the interview, potential opportunity or job offer on social networks – no matter how tempting it is to share a good or bad experience. 12. Don’t tweet or share information about the job, candidates or new hires on social networks until you’ve sent an email or letter to all candidates letting them know about your decision. 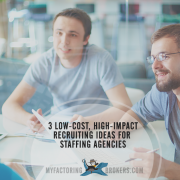 We work with top staffing factoring companies to offer staffing invoice factoring and payroll funding services to staffing agencies, temporary employment services firms and similar placement agencies. Get a free quote for agency factoring or staffing payroll financing or request information about any of our business loans and financing programs by submitting the form below.